$48 for a glass of coke? Times they are a-changing and the economy is tough all around. It’s not unusual to pay $2 to $4.00 just for a bottle of water at a ball park or amusement park. But $48 for a coke? My family and I were recently on vacation at Disney World, which pretty much by definition elevated the cost of most ordinary things right there. 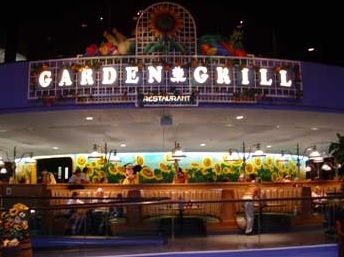 We dined at the Garden Grill Restaurant in EPCOT at The Land pavilion. We have dined there many times before on their rotating restaurant and have always enjoyed a good experience. But on this particular occasion, my youngest son ordered a coke but did not eat the meal, which is served family style. The waiter asked about this, and cleared his clean plates dutifully. When it came time to settle the bill, our waiter announced that he “had” to charge my son the full meal price. Naturally, I questioned him about this, pointing out that he knew he hadn’t eaten and cleared the unused plates and utensils himself. He was very sorry, though he didn’t sound sorry, but told us that it was the restaurant’s policy. He would have to check with the manager. My daughter’s friend, who was on a separate check, paid $48 for her meal, drink, tax and tip, so it was not an inconsequential amount of money we were talking about here. Now here is where it gets really interesting. We have been coming to Disney about every other year since 1994. We are members of the Disney Vacation Club. I would hazard to say that we ate at the Garden Grill restaurant all but one or two of those times, as it is was one of our favorites. My youngest son is our pickiest eater. This is not just an issue of what type of food is served as it also is where the food is served. He ONLY eats steak–prime rib–at Outback. He won’t eat steak at LongHorn or Texas Roadhouse. He will not eat it here or there, he will not eat it anywhere but Outback. He will eat spaghetti at Olive Garden with tomato sauce. He has NEVER ordered anything else at Olive Garden. He will not eat spaghetti anywhere else. If we eat at Friday’s or Chili’s or any of the other myriad establishments, we generally just order him a drink (sometimes a dessert since his criteria for sweets is much lower) and we drive through McDonald’s or Arby’s on the way home for his meal. By the way, he has never eaten a meal at the Garden Grill. Oh, and by the way, we have never paid for a meal for him at the Garden Grill. With a Disney smile on her face, and Mickey Mouse scooting behind her running to get away from any crossfire trying to get to the next table for photographs, the manager informed us that the restaurant had a policy that each diner is charged, regardless of whether they ate or not. She tried to offer him things off the children’s menu to appease us (he NEVER eats Mac and Cheese ANYWHERE.) He wasn’t really hungry anyway because he knew we were coming to the Garden Grill and he knew he didn’t want to eat there. He already ate something earlier. He played games on his phone the whole time. I couldn’t believe they were going to charge me $48 for a coke–which he only drank about two-thirds of anyway. There was still $16 worth of coke in that glass and there are kids dying of thirst in a desert somewhere! Now in all honesty, I understand why this restaurant might have such a policy. I’m sure there are parent’s with young kids that want to get their pictures taken with Mickey Mouse and Goofy, but the little ones wouldn’t eat enough to make even the price of a children’s dinner worthwhile. So mom and dad think they’ll sneak little Johnny a few bites and save a few bucks. But my son is 15 years old and we weren’t sneaking him bites. And this is Disney! Is the bottom line that tight that we can’t let a kid ride a rotating restaurant and get his picture taken with Chip or Dale or both for that matter, without forcing him to eat, or forcing his parent’s to pay for a meal he never had any intention of digesting? The manager then noted that had we told them that ahead of time when the reservation was made, then he would have not been charged. How were we supposed to know this? Another Disney smile and an apology. So I guess we got a glass of coke and an apology for $48. I wasn’t aware the price of apologies had gone up. The writer woke upon a slab of granite. It was really just a rock, but being a writer, a rock was simply insufficient to describe that upon which he awoke. It was too flat to be a boulder. It certainly was as hard as granite, but he doubted that it was granite. After all, he was a writer, not a geologist. He sat up gingerly; his head pounding. His vision was blurred. He couldn’t remember where he’d left his glasses. He was trapped in a prison of stone. Or rock. Granite. Maybe gneiss. That wouldn’t be nice. But talc would be nice. He could claw and powder his way out of that conundrum. Alas, it was a prison of stone. Why, oh why, had he not taken geology in college? Even more curious, there was light. And it was good. Otherwise, he’d have been trapped in a stone prison in the dark. Like a tomb. But there was no apparent source of light. He rubbed his temples, massaging away the cobwebs. Squinting, he saw a table and a single chair. Well, it’s not as though he was going to have company over anyway. A single sheet of paper was on the table and the strange light with no source seemed centered on that. He slowly rose and shuffled to the table, noting as he got nearer and could see better that there was a pen beside the paper. He pulled the chair out with a mock flourish and sat down. It was an oak chair and table—good and sturdy. Odd that he would know his wood better than his stone, since he had not taking botany in college either, but life was strange that way. 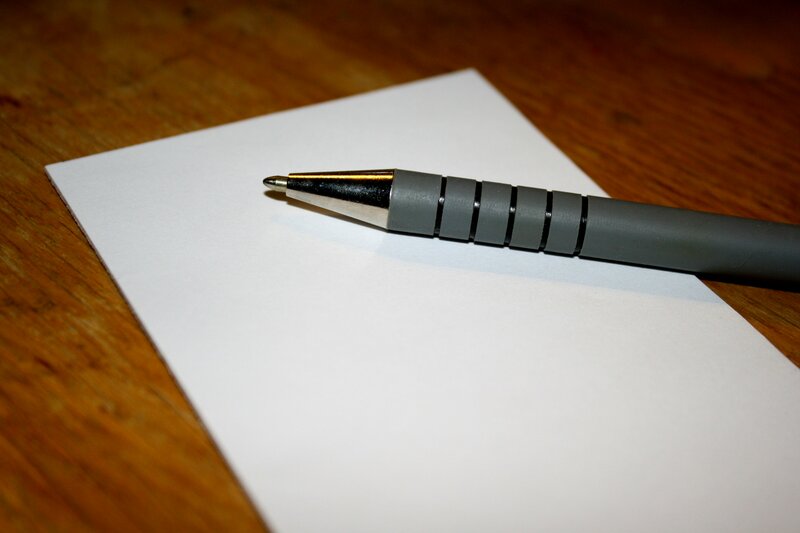 How could something as simple as a piece of paper seem so threatening? Yet, it held the key to his prison. He thought back on the events which brought him to this rocky point. Or would that be a stony point? She was playing games with him, but the challenge was proving too great. Michelle Weber, the evil temptress of Word Press, had cast her spell. Write about something you would not write about. So simple, yet so deceptively evil. As soon as he wrote something on the paper—about anything—then by default he had written something about it and the ink disappeared. His headache grew stronger as his spirit fatigued. The paper and pen were the rock and hill in this version of Sisyphus in which he now starred, although in that myth a boulder was probably the proper analogy. Granite or gneiss was immaterial to the plot, much as it is here. Each time he tried to write about what he would not write about, the words disappeared, and he was forced to start over. Curse the sorceress Weber! How can she torture him so? Why? He buried his face in his hands, his breathing ragged with a mixture of anger and frustration. He was a writer. He could write about anything. He would write about anything. So there was nothing for him to write. No way to solve the puzzle. No way out of this prison. He would die here, a skeleton and dust decaying on a solid oak chair before a blank piece of paper. There was nothing for him to write. Perhaps the stone is basalt. Is that possible? He took his hands away from his face, a smile carving its way over his haggard features. He snatched up the pen and with a dramatic flourish penned the words that bought him his freedom. I would never write about nothing. He threw down the pen and raised his arms in victory—either that or the field goal was good. And instantly, the rock walls melted away and he was back in his own bedroom, with a real bed. He still had the headache, and he had resorted to a double negative which gnawed at his soul. He would never be the same. Well, maybe never isn’t the right word . . .
There’s no place like zone . . . there’s no place like zone. But where, for art thou, is my zone? 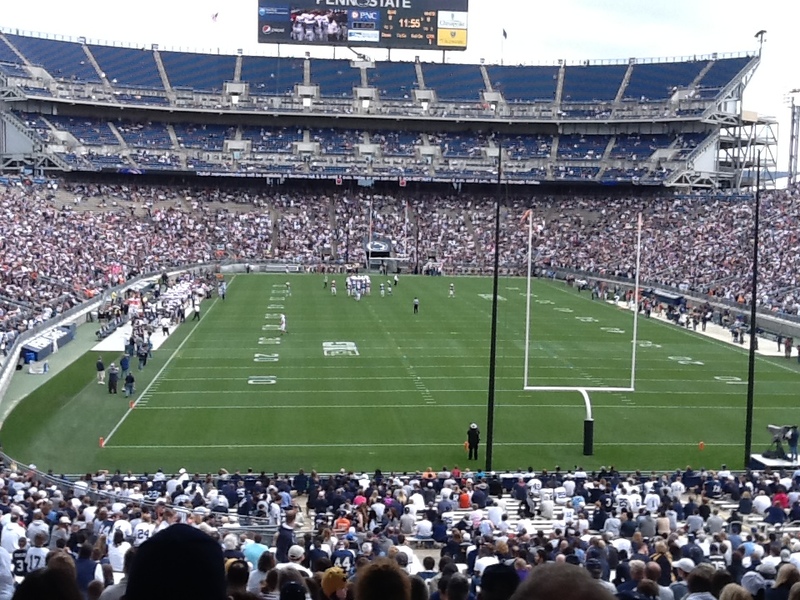 The obvious answer is the North End Zone at Beaver Stadium where I have season tickets. I have spent many an enjoyable Saturday afternoon there, and a few not so enjoyable ones as well. When the crowd is cheering–108,000+ fans–there is an electricity in the air, a power which one can only experience but not describe. Those who have been there know it. It simply is nothing you will get watching a sporting event on TV. You have to feel it. As a runner, I often find myself ‘in the zone.’ I usually listen to music when I run, and at some point I become one with the road and the beat and I feel like I could run forever. It is very relaxing and even the tensions of my worse days melt away with the pavement beneath my feet. I have never ‘hit the wall’ as some runners claim, but I have run into a few cars, sign posts and the occasional tree. I’m just kidding about that, although I have been close to getting run over by cars and buses. I despise–no loathe–construction zones. I know they are a necessary evil on our roadways, but necessity does not breed acceptance. I really don’t like the O-zone, not the protective layer but the football site. It’s too bad hydrochlorofluorocarbons can’t put holes in that as well. I liked the Twilight Zone, the original series (the movie was OK), but for better or worse, I have never been in the Twilight Zone. Here I am–in the ZONE! There is just something very relaxing about floating on cool water while basking in the heat of gorgeous sunshine. I could float for hours, just California day dreaming, reading a book, sleeping, or making Vitamin D.